Listening to understand, rather than listening only to respond, requires a high level of mindfulness and consciousness, especially when we are communicating with people of different cultures. I was facilitating a program in Singapore last month when this thought came to the forefront. I observed the consequences of a situation where a group of people became aware that although they were being listened to, felt that they were not really being heard. Given there were several cultures represented in the room, there was an increased need for clear and effective communication, which unfortunately wasn�t occurring as well as it should have been. The result was that a particular team from a regional office felt disrespected, frustrated and placed little value and trust in the discussion session. I observed this through their responses - or lack of at times, their body language and the overall disengaged atmosphere that pervaded the workshop by the end of day one. A shifting of styles was necessary the following day to achieve the desired outcomes. It is only as we listen to understand that we can observe the cultural nuances and cues that can make for a greater level of understanding and more effective communication. For this to occur our emotional and cultural intelligence needs to be heightened. Different usage of words, accents and body language all make for complexity when communicating with individuals whose native language is different to the one being spoken. Effective listening provides an ability to empathise and be more attuned to the other party�s situation and requirements. How can we demonstrate that we are truly listening? Summarize what is being said regularly, especially if your language is not the native language of all the participants of a session. This will provide reassurance that you comprehend what is being discussed. Use written summaries � simple dot point summaries and drawings on a whiteboard are much easier to understand by those whose spoken language skills are lacking. Ask questions and request clarification when appropriate. Probe deeper into an idea when you are not certain you fully understand what is being said to you. Remember to nod - it demonstrates that you are listening and understanding the speaker. Restate the idea that is being discussed using a different, and ideally more simple vocabulary. Don�t be afraid to allow sub-conversations to develop. Frequently these conversations are more about how to communicate an idea back to you, rather than a sign that attention is wandering. If possible, keep the mood light and casual so that participants don�t feel under pressure to speak perfect English or to conform to a communication style which they maybe unable or uncomfortable to comply with. Remember that unless you speak all the languages represented in the room and understand the cultural nuances being displayed, that you are the weak link which is preventing everyone�s voice from being heard. Keeping this thought in mind should help you to focus your efforts on really comprehending those around you. As One is the culmination of two years of research from Deloitte Touche Tohmatsu Ltd in a study of the challenges that leaders face in creating effective collaborations. One of the themes is how do you create a common purpose for large groups of people to work effectively? The team created 60 case studies that investigated successful examples of the many modes of 'As One Behaviour'. Some of the case studies include some big names such as Apple, GE and Pixar. The authors posit that there are 8 archetypes of leaders and followers. The key is to match the most effective archetype to what needs to be accomplished by the organization. I particularly liked this fast-paced book for its multiple models approach and it�s 8 archetypes that we can all relate to. 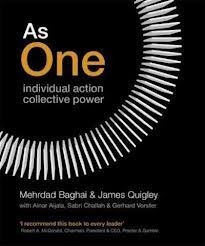 "As One: individual action collective power" by Merhrdad Baghai & James Quigley (2011).